24-hour airport shuttle service is available on request. Fees may apply. Contact the property in advance to get details. Guests will receive an email with check-in instructions 1 week prior to their arrival. For more details, please contact the office using the information on the reservation confirmation received after booking. This property may require a deposit for certain dates or reservations of a certain length. For more information, please contact the office using the information on the reservation confirmation received after booking. Hits and misses - overall still ok! Lots of dining options around here, from the Time out market to our fave Taberna, to a fab steakhouse just around the corner. What we do not care for: the water pressure in the shower was less than satisfactory, we had problem at check in as a wrong code was sent causing a minor panic, the housekeeper did not show up on the day we agreed on, the tv did not work. But, beautiful apartment, lovely lively neighborhood... And really, good value. Just go in knowing that the management company feels a little short handed and your stay might be less well coordinated than you would expect it to be. Great accommodation in great area for all amenities. Gaining access to the apartment was haphazard and lacked follow thru. Once we were in, it was fine. 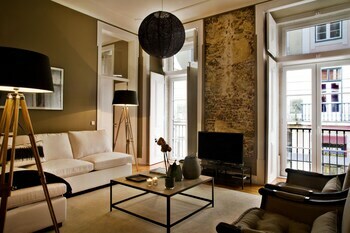 We had a great stay in Lisbon and loved the city and the apartment. We would definitely stay there again if visiting Lisbon again. The only thing which let the apartments down for us was the check in and check out ... As there is no reception like there is in a hotel, we had to let the apartment managers know that we had arrived and they then came to meet us. Unfortunately this meant hanging around for over half an hour, despite the cal being made when we left the airport so allowing for plenty of time for someone to arrange to meet us. The keypad process for getting into the building and then the apartment was straightforward so I don't know why this isn't given in advance and then a meet and greet arranged for a later time so that there isn't all the hanging around, which is not what you want after a day of traveling. Also, when we arrived at the apartment, we were told that we could leave our luggage in the apartment on our check out day, but were then contacted on our last day to say we could not do this after all and so we should leave our luggage in the cupboards in the communal areas of the building, but these were far too small (and full of other things) for our bags to be stored so we were directed to a left luggage business down the road, which cost us 12 euros. The service we received from Lisbon Luggage was great, but disappointing that we had to pay for this service. Apart from these grumbles, which took the shine off, the accommodation is very good.